In 2010, Adriana began volunteering at Community Teamwork’s family shelters in Lowell, MA, that serve hundreds of homeless families at any one time. 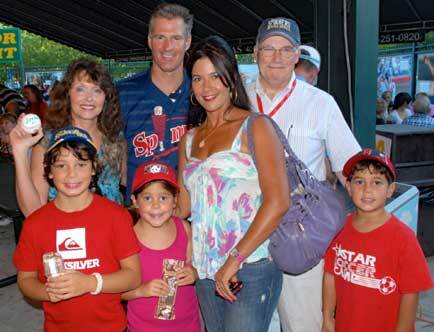 In August 2010, Adriana invited dozens of homeless children, their parents and several staff members of the shelter to a Lowell Spinners baseball game for a fun and positive family outing. She financed tickets to the game, a BBQ dinner for all the shelter’s families and gave each of the children a customized gift bag filled with presents. Adriana and her three young children joined their guests in the stands and bonded with the families and staff during the game. She introduced the director of the shelter and key staff members to U.S. Senator Scott Brown and subsequently arranged a meeting between Brown and Community Teamwork, resulting in further assistance to families in need. 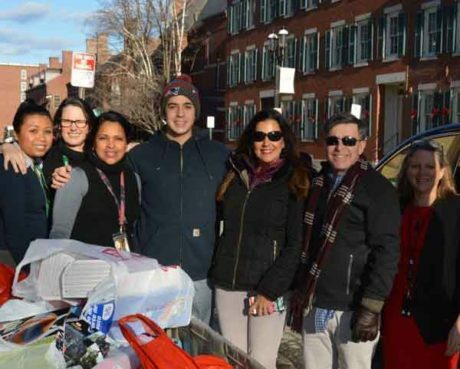 DECEMBER 21, 2017: Adriana and her family lead a holiday toy & clothing drive for dozens of homeless families living in a MA domestic violence shelter so all the kids living in the shelter receive presents under the tree Christmas morning. And special gifts were delivered for the moms too! In December 2010, Community Teamwork’s Shelter Director reached out to Adriana with troubling news: the shelters were unable to fund Christmas presents for the families with children. Refusing to allow any child to wake up Christmas morning without a present, Adriana immediately sprang into action and personally bought dozens of presents for each of the children, as well as scarves, hats, mittens, clothing and other basic necessities that the mothers living in the shelter needed for their children. She was able to customize gifts for the shelter children, ages infant – 18, so they would all receive age appropriate gifts they would love. 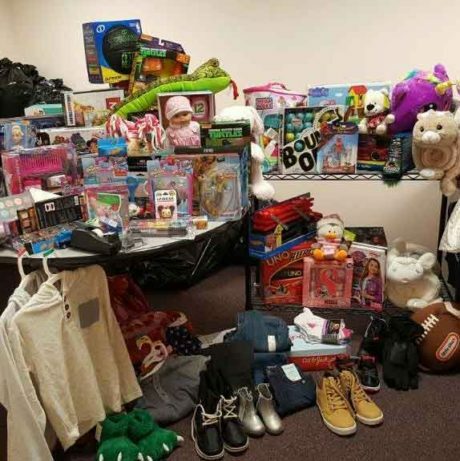 Adriana organized a toy drive for the children in the Commuity Teamwork shelter in Lowell, MA. For the past few years, my kids and I have been volunteering at Community Teamworks, a wonderful nonprofit that provides shelter to hundreds of homeless families throughout Massachusetts. Although Community Teamworks does an extraordinary job providing critical services and support to thousands in need throughout the commonwealth, there is no budget for Christmas presents for the many children living in its shelters. In addition to the gifts she bought personally, Adriana also reached out to friends and members of the local Concord community to organize a toy drive for the children in the shelter. 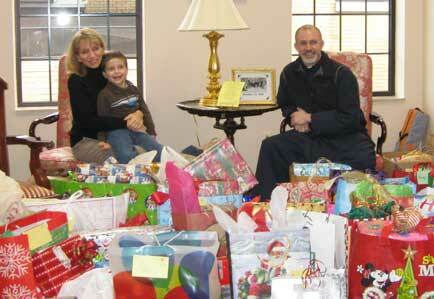 Many generous families in Concord helped Adriana gather toys, books and necessities for the children and their families. The week before Christmas, Adriana and her three young children personally delivered over 150 Christmas presents and basic necessities to homeless children. Staff members helped wrap the gifts so that each child in the shelter would wake up on Christmas morning to find a beautifully wrapped, personalized gift waiting for him or her under the Christmas Tree. – Karen Frederick, Executive Director of Community Teamwork, Inc.
Additionally, Adriana reached out to her media contacts to secure a prime time television segment on WCVB- Channel 5, bringing awareness to the needs of the homeless families to rally further public support for those living in the shelter. The Executive Director, Karen Frederick, was featured with Adriana and other key staff. Special thanks to Channel 5 and morning anchor Randy Price for helping rally public support for the families living at Community Teamwork. After hearing from families how much they enjoyed the first outing, Adriana treated them to a second Lowell Spinners game. Dozens of children and their parents were again invited to the game for a much-needed positive family outing. 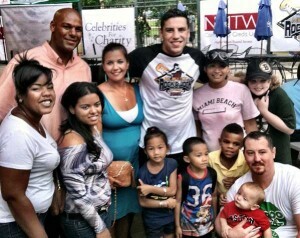 Adriana arranged VIP treatment at the baseball game, BBQ and a private meet & greet with Boston Bruins players, including Milan Lucic. She also personally purchased dozens of backpacks for the children and filled them with back-to-school supplies. Babies/toddlers who attended received a mini backpack or gift bag filled with stuffed animals, baby books and other toys. Special thanks to Celebrity Marketing, Milan Lucic and the Goodwin Group for helping Adriana support Community Teamwork’s families and welcoming them to the game.